a check weigher (q.v.) who works at Billy Fairplay, a machine connected with screens which registers weight of small coal to be deducted from gross weight sent to bank by each getter. 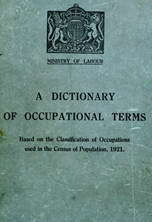 oversees in the interests of the colliers, in accordance with provisions of Section 13 of Coal Mines Act, 1887, weighing of coal (or shale), by weigher, in tubs; estimates amount of foreign matter or dirt in tub and sees that only authorised deductions are made; checks tare or weight of tub itself; makes records in his own weigh book again-t number and name of hewer and agrees weights with weigher (q.v.). weighs railway wagons, trucks or carts of coal, etc., as they pass weighbridge, on leaving colliery sidings; reads dial of weighbridge and keeps record of gross weight, tare and number of each wagon; attaches tickets to wagons with destination written thereon. weighs tubs of coal, etc., on weighing machine as they come up from pit. on behalf of colliery company; reads dial of weighing machine, estimates amount of dirt or foreign matter; checks with check weigher (q.v. ); records name and number of hewer, gross weight, tare and weight of dirt, in company's books.